Look at this 2017 GMC Acadia SLE. Its Automatic transmission and Gas I4 2.5/150 engine will keep you going. 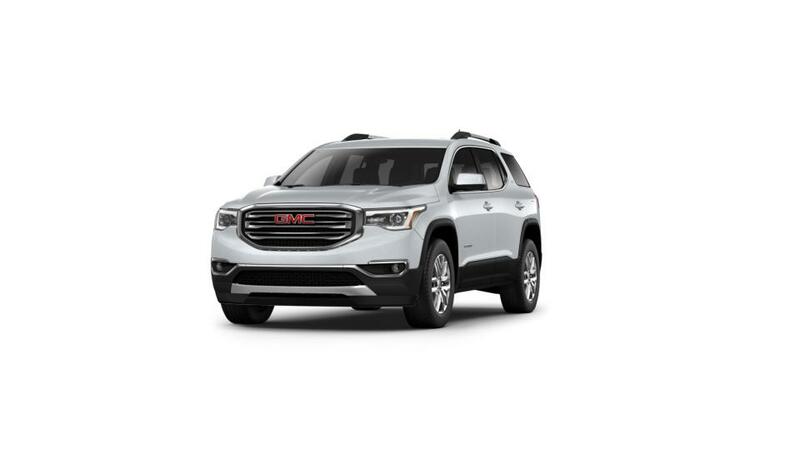 This GMC Acadia has the following options: Wipers, front intermittent with washers, Wiper, rear intermittent with washer, Windows, power with driver and passenger Express-Down, Wheels, 4 - 18" x 7.5" (45.7 cm x 19.1 cm) aluminum, Wheel, spare, 18" x 4.5" (45.7 cm x 11.4 cm) steel, Transmission, 6-speed automatic (Included with (LCV) 2.5L 4-cylinder engine. ), Tool kit, road emergency, Tires, P235/65R18 all-season, H-rated, blackwall, Tire, compact spare, T135/70R18, blackwall, and Tire pressure monitoring system. Test drive this vehicle at Cavender Buick GMC West, 7400 West 1604 North, San Antonio, TX 78254. Check out this 2017 GMC Acadia SLT. Its Automatic transmission and Gas V6 3.6L/223 engine will keep you going. This GMC Acadia comes equipped with these options: WHEELS, 4 - 18" X 7.5" (45.7 CM X 19.1 CM) ALUMINUM (STD), TRANSMISSION, 6-SPEED AUTOMATIC, TRAILERING PACKAGE INCLUDES FACTORY-INSTALLED HITCH 4000 lb. towing, 7-pin wiring harness, Class III hitch and (V08) heavy-duty cooling system, TIRES, P235/65R18 ALL-SEASON, H-RATED, BLACKWALL (STD), SPARKLING SILVER METALLIC, SLT-1 PREFERRED EQUIPMENT GROUP Includes Standard Equipment, SEATING, 6-PASSENGER (2-2-2 SEATING CONFIGURATION) (STD), RECLINING FRONT BUCKETS (STD), LICENSE PLATE BRACKET, FRONT, and JET BLACK, SEAT TRIM, PERFORATED LEATHER-APPOINTED. See it for yourself at Cavender Buick GMC West, 7400 West 1604 North, San Antonio, TX 78254. Check out this 2017 GMC Acadia SLT. Its Automatic transmission and Gas V6 3.6L/223 engine will keep you going. This GMC Acadia comes equipped with these options: WHEELS, 4 - 18" X 7.5" (45.7 CM X 19.1 CM) ALUMINUM (STD), TRANSMISSION, 6-SPEED AUTOMATIC (STD), TIRES, P235/65R18 ALL-SEASON, H-RATED, BLACKWALL (STD), SLT-1 PREFERRED EQUIPMENT GROUP Includes Standard Equipment, SEATING, 6-PASSENGER (2-2-2 SEATING CONFIGURATION) (STD), RECLINING FRONT BUCKETS (STD), LICENSE PLATE BRACKET, FRONT, JET BLACK, SEAT TRIM, PERFORATED LEATHER-APPOINTED, IRIDIUM METALLIC, and ENGINE, 3.6L V6, SIDI, DOHC with Variable Valve Timing (VVT) (310 hp [231.1 kW] @ 6600 rpm, 271 lb-ft of torque @ 5000 rpm [365.9 N-m]) (STD). See it for yourself at Cavender Buick GMC West, 7400 West 1604 North, San Antonio, TX 78254.